What Causes Common Calf Injuries? If the calf muscles are suddenly overstretched, some or all of the fibres may be torn, known as a calf strain or rupture. 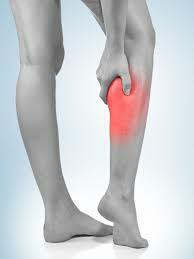 This is the most common cause of calf muscle pain. It usually happens whilst playing sports such as basketball, tennis and running where the person suddenly pushes off from a stationary position or has to change direction quickly which places a huge force through the muscle.